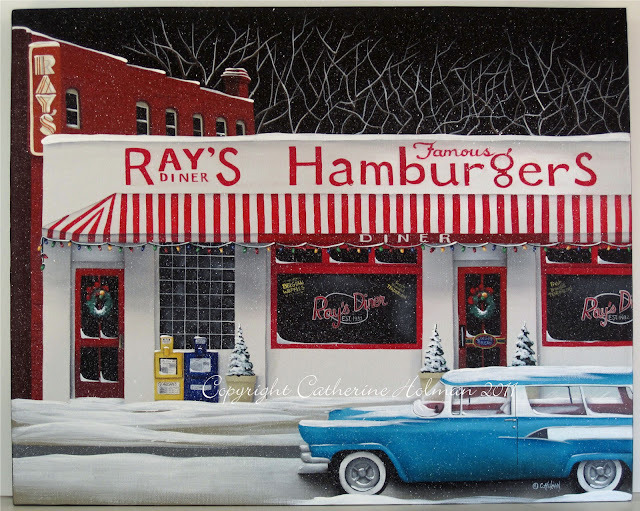 I've been wanting to do this painting for a couple years now and have had this vision of Ray's Diner as a 50's Christmas scene with the big bright lights from my childhood that we used to hang on the tree as well as outside. I realize it's a little early for Christmas, but I just couldn't wait any longer. Established in 1932, Ray's Diner has served breakfast and lunch to locals and visitors who return year after year. The aroma of bacon and eggs cooking on a grill in front of the customers at the counter, lingers in the air causing stomachs to growl. Coffee is served while food is cooking and customers catch up on the local gossip or read the morning paper. Step back in time at this 50's diner famous for their burgers and chili. When I finished the building, the painting looked a little blank so I added the old station wagon for a little more color. I can just invision mom and dad in the front seat and the four of us kids in the back pushing and yelling, "Mom he's touching me!" Life was grand in the 50's. I changed the sign on the door to "Ginger Bread". 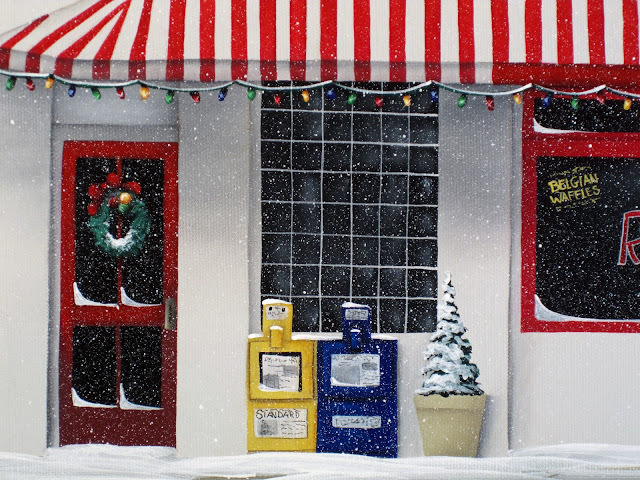 The Daily Standard, our local paper is in the yellow newspaper stand. 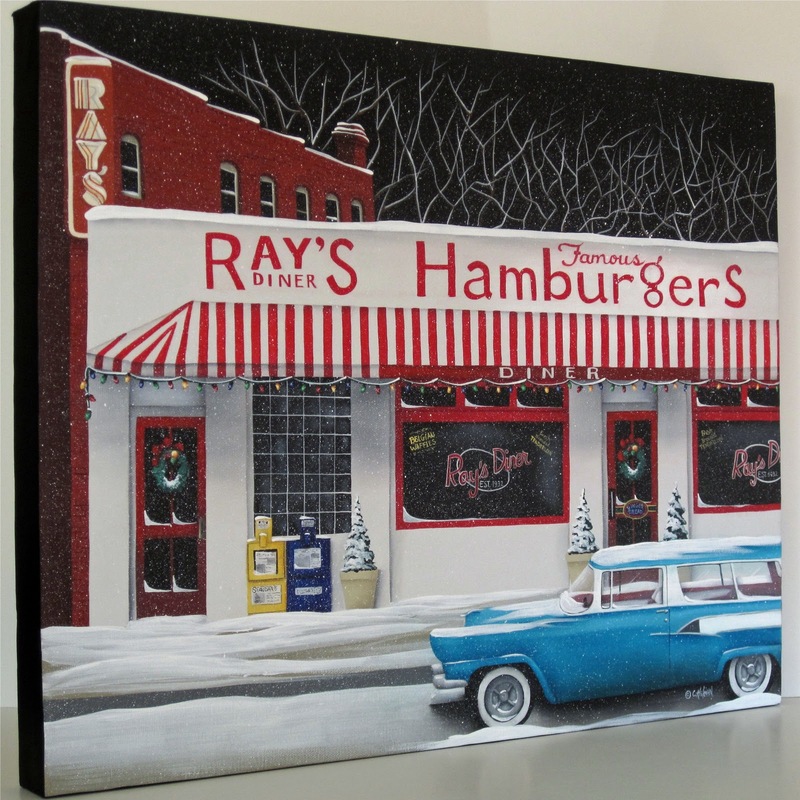 When I was in high school we used to stop at Ray's before the Friday night football games for a hamburger and fries. 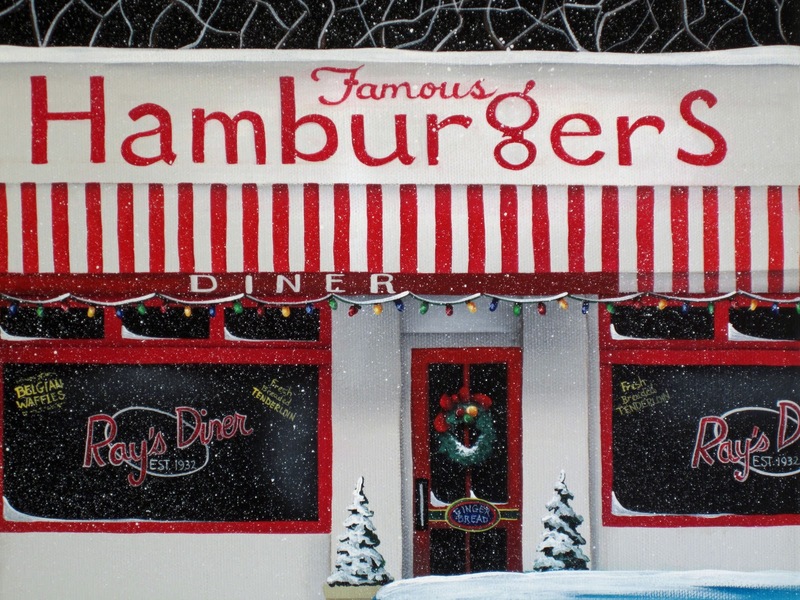 They still make one of the best burgers around! You can bid on this painting on eBay by clicking here. The auction ends next Friday evening. I love this painting. I truly brought back memories for me too! Catherine, this is gorgeous! I love it, and all the great memories...how wonderful. What a terrific way of documenting the history of your own family and your own hometown. Love it! And it looks a little like a diner I have known and loved. Cathie, what a great painting!! My parents had a station wagon like that when I was born!! Great memories!! 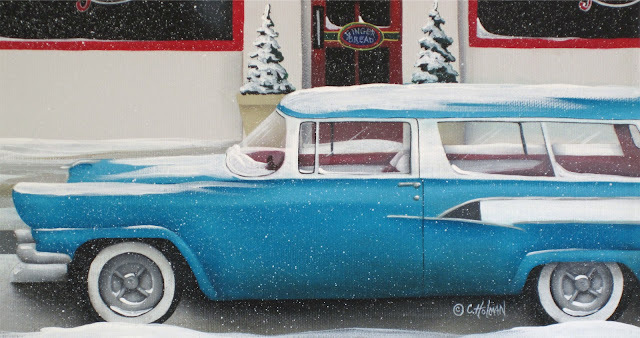 Catherine, this painting is fabulous, I love the stationwagon out front, it is the finishing touch to the whole piece. It is just lovely. I love especially your winter scenes and this painting is nothing less than perfect. That reminds me of sitting in empire diner in NY.